Music is one of the best things about being alive. It's the best way to connect with people and to connect with ourselves. There is a song for every emotion, every situation and every mood in the world. But amongst all the songs in the world, there is one song that reigns supreme above the rest. The Killers' "Mr. Brightside" is the best song in the world. "Mr. Brightside" has been a hit since its release in 2003, and although there are a million reasons why this is the best song to ever exist, here are just a few of the most important ones. 1. The opening guitar riff. 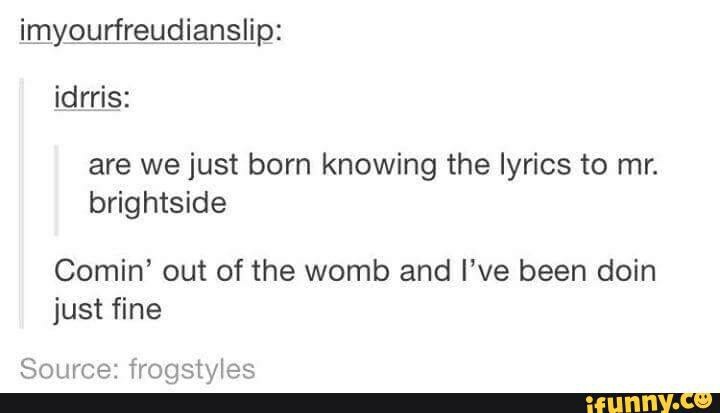 Everyone knows the opening part of "Mr. Brightside," whether you're 97 or a newborn infant. Once you hear the first three notes of guitar riff in the beginning of the song, you know things are about to get real. 2. The lyrics are an example of modern art. At first, the lyrics seem just to be filler for really awesome music (what cage is he coming out of? ), But, then you realize the lyrics are extremely passionate, meaningful and heart-wrenching. 3. And the lyrics are fun to sing. It started out with a kiss, how did it end up like this? It was only a kiss, IT WAS ONLY A KISS! 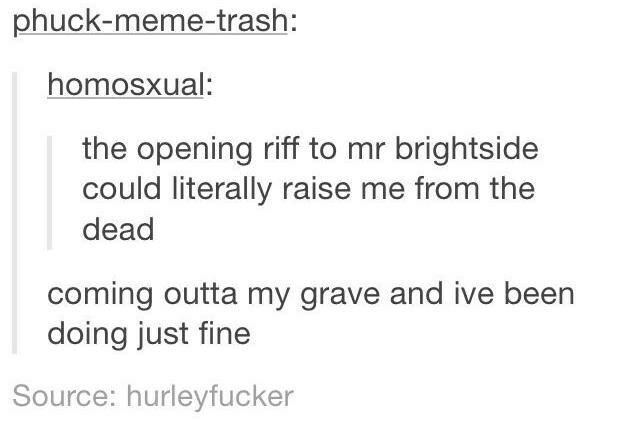 But really, can you remember a time you listened to "Mr. Brightside" and didn't scream/sing the lyrics? 4. The music video is also modern art. A man in love with an old-fashioned lady of the night, with dancing, fireworks and forbidden fruit is the only music video I'm interested in ever watching. 5. The story behind the song. The leader sing of The Killers wrote the song after his girlfriend cheated on him, meaning that 1) she made the worst mistake of her life, 2) she is reminded every time Mr. Brightside plays ever and 3) he made something beautiful out of something terrible which is inspirational as heck. The song has spent 167 weeks of the UK's Singles Charts, and is Last.fm's most downloaded song ever. It's sold over 3 million copies in the US and is known to be James Blunt's favorite song. Even the most serious of music snobs can agree that "Mr. Brightside" is not only an undeniable bop, but an artistically written piece of music. 8. It's made a lot of great memes. I don't think I've ever seen another song produce so many memes. 9. It's the perfect song to jam out to. 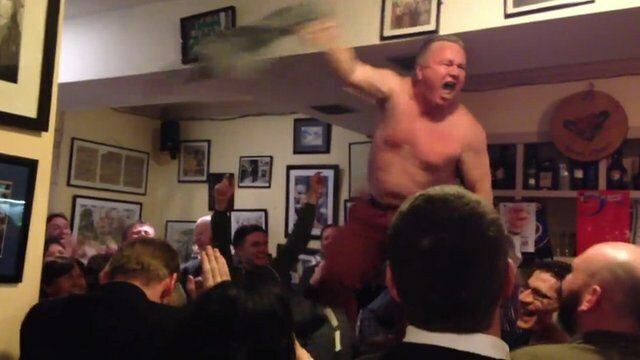 Who hasn't jumped around and screamed to "Mr. Brightside" at least once in their life? 10. It's actually perfect for everything. Are you sad? Happy? Excited? Bored? Working out? Going on a car ride? Is it night time? Are you falling in love? Is your heart broken? Are you doing homework? Are you at a frat party? Are you coming out of your cage and doing just fine? Even at a funeral, this song is the perfect song. Literally, have you meant someone who doesn't like the song? I've met more people who like than I've met people who didn't like "Mr. Brightside." 12. We're born to love it. Even though it's impossible, doesn't it feel like you were just born knowing the song "Mr. Brightside?" Like the first time you heard it, you already knew exactly what song it was. It was the song society needed, and we didn't even know it. 13. It's literally just the best song ever. You didn't click on this article because you need to be convinced, you clicked on this article because you thought, Heck yeah, "Mr. Brightside" is the best song ever! 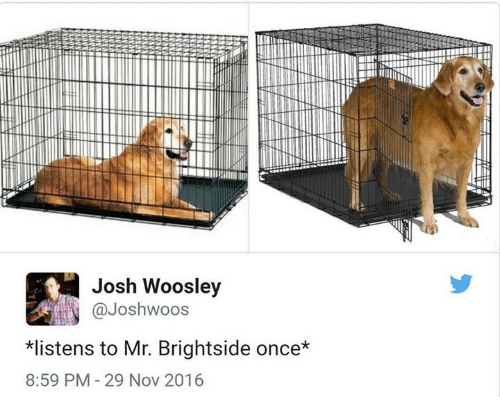 It's a cold-stone fact that even the biggest music snobs can't deny; "Mr. Brightside" is a work of art we are all so lucky to be alive to experience.